The core of our commerce platform, Teamwork POS was engineered to join together the robust features of an enterprise POS system with the flexibility and chic look of a mobile device. With no servers or bulky appliances, we still offer a robust platform with an array of features and custom fields. Included in our POS, are several retail applications such as Time Card, Stock Count, and Shipments. 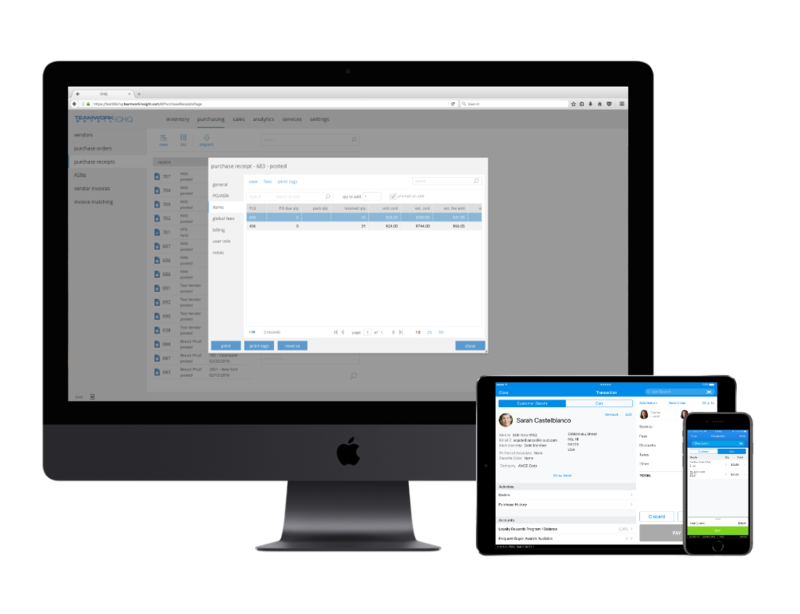 The native iPad-based application uses cloud technology for a centralized database ensuring real-time data across all channels. Since it is native based, if you lose internet, you can still ring up sales and register customers. As soon as the internet goes back up, Teamwork automatically sends all the information up to the cloud. We make sure to provide the right tools needed to make sure you never miss a sale. Mobile app with all the versatility needed for stores of all kinds. It’s built for environmental durability. Rapid deployment is made possible without in-store server because of our cloud-based computing architecture. The Point of Sale app is supplemented with an array of apps that provides a range of retail management all from an iPad.